Indicators: RSI – 8, EMA – 8 on RSI window, ATR – 20 on RSI window, EMA – 28 on main window, Monthly Pivot. Use the EMA-28 to determine the trend direction on the daily chart. 1. 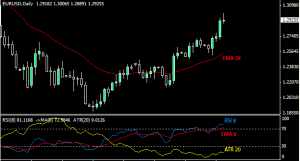 RSI must cross from below to above EMA – 8. 2. 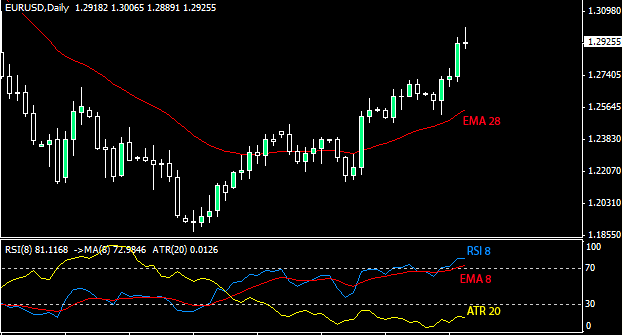 Enter when a new candle opens and the RSI is still above the 8 – EMA. StopLoss – 75% of the value of the ATR – 20. TakeProfit – use resistant and support of Fibonacci or the monthly pivots ( let the profits run ).